The second trimester is when most women start feeling better. Your weight gain at this time should be about a pound a week adding up to about 12 to 15 pounds. Usually the second trimester is when you will feel the very best during your pregnancy, the morning sickness has usually passed, you are not really huge yet so it is still relatively easy to get around and you have an abundance of feel-good hormones running through your system. The second trimester is also when the baby starts to move around so it is a very exciting time. 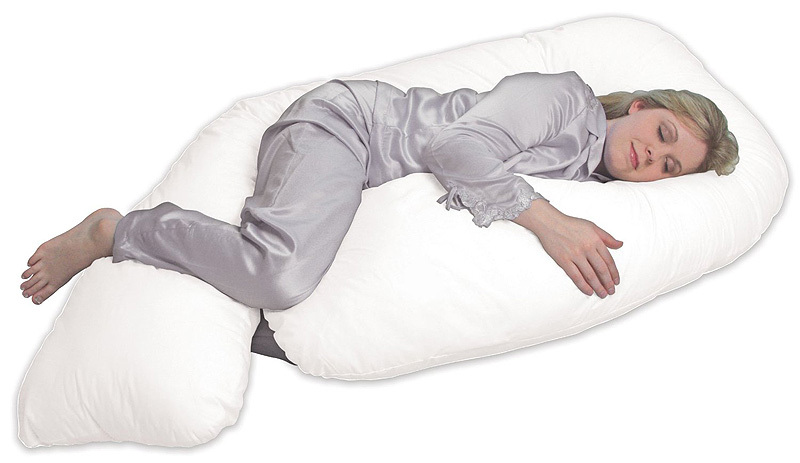 The last trimester, or the 7th, 8th and 9th month, your belly is starting to become huge. It becomes much harder to get around. At this point you should still be gaining about a pound a week until the very end when your weight gain may start to slow down as your due date gets closer. However, some women continue to gain weight and water retention can be a problem towards the end so you may weigh even more. So if you gain about 25 to 30 pounds and your baby weighs about 7.5 pounds where is all that weight located? While many women believe that weight gain during pregnancy is quite normal, a number of doctors have put forth some facts which define healthy weight gain during pregnancy. During this phase of nine months woman needs to gain only the weight which is needed. As people think that it is perfect to gain some extra pounds, putting on more weight too can cause troubles. 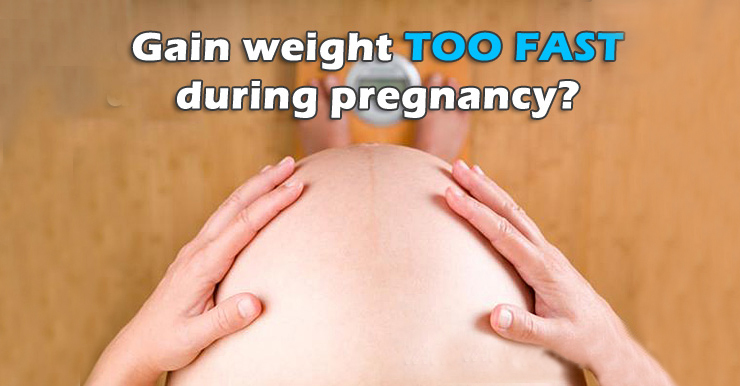 Most doctors recommend a weight gain of anywhere between 25 and 30 pounds for a healthy pregnancy. However, some gain a bit more and some may even gain a bit less yet still have a healthy baby and a healthy body afterward. Typically you should gain about 3.5 to 4 pounds during the first trimester, about 12 to 15 pounds during the middle trimester and about 8 to 10 pounds in the last trimester for a total of about 30 pounds or so. You’re probably asking yourself, how much weight should I gain during pregnancy? However, many women actually lose weight during the first trimester due to morning sickness. This is actually normal and nothing to be concerned about so long as your weight gain picks up afterward and the baby is making normal progress. The normal weight gain during pregnancy has to be a slow and a steady process which again has to depend on your actual weight and the body type. We thus bring in some general guidelines to give an insight on weight gain during pregnancy. You can as well check with your doctor for any other suggestions. Let us have a look at the details which can explain more about the average weight gain during pregnancy. If you are said to be under weight before pregnancy then you can gain from 28-40 pounds. Similarly women with a normal weight can gain from 25-35 pounds. If you are overweight before being pregnant, then you can gain 15-25 pounds. Likewise obese people can gain around 15 pounds and not more than that. In cases where you are pregnant with twins you can gain 35-45 pounds. 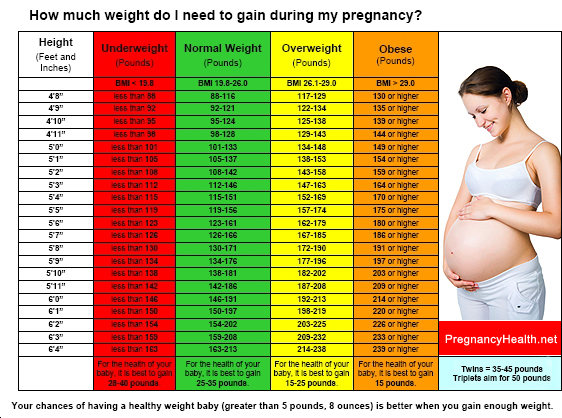 Similarly there is also a weight gain chart during pregnancy which defines how much weight one can gain during each trimester. Let us also have a look at that in detail. Weight gain during 1st trimester- Women can gain up to 1 – 1 ½ pounds in a month for the initial 1 to 3 months. She needs to consume about 200 extra calories in a day. Weight gain during 2nd trimester- Women can gain about 1 pound in a week and a total weight gain of 12 – 14 pounds is considered as a normal weight gain. They need to consume about 300 extra calories per day. Weight gain during 3rd trimester- Women can gain about ¾ to 1 pounder per week even during the 3rd trimester. So a total of 10-14 pounds is normal weight gain. They also need to consume about 300 -500 extra calories in a day during their last 3 months. There is also a weight gain during pregnancy chart which explains as to how the weight gained during pregnancy is distributed. Let us have a look at that as well. During an average pregnancy, the weight which is gained by the mother is distributed as mentioned below. The above mentioned is the healthy weight gain process in any pregnant woman. If you have any other health aliments and are putting on excessive weight it is important to take the doctors opinion before changing your diet. Well the average baby weighs about 7.5 pounds, some are less and some are more. The amniotic fluid weighs in at about 2 pounds. The placenta will weigh about 1.5 pounds and your breast enlargement in preparation for feeding the baby will account for about 2 pounds. Your uterus started off quite small, about the size of a golf ball but it has enlarged to accommodate the baby and it now weighs over 2 pounds. You should have about 4 pounds of extra blood circulating in your system and nature has made sure that you have about 7 pounds of additional fat in order to save the baby in case of famine. Not to mention, if you are retaining water, which usually adds up to another 4 pounds. All in all it adds up to around 30 additional pounds. And that is healthy and the way it should be. You should gain weight during pregnancy, your body is doing some amazing things when it is creating this life inside of you. Now you may gain more weight or you may gain a little less. Some women have 10, 11 or 12 pound babies and some women have babies that weigh in at 5 pounds or less. You want a healthy baby regardless of the weight. It is important to monitor your weight and try to have a healthy weight gain throughout. Your doctor will weigh you at every appointment so you will know where you are. Do not try to slow down your weight gain by dieting or doing anything crazy like that. You and your baby both need proper nutrition at this time and it is very important. You need to eat a healthy and balanced diet and make sure that your diet consists of healthy and nutritious foods and little or no junk. After delivery you can begin to think about losing the weight but it may not come off quickly and that is okay. Your body needs time to recuperate. You can speed up your weight loss efforts by feeding your baby the best possible food, which is human breast milk. Breastfeeding is the very best food for babies and it is also the healthiest thing for the new mom. Keep in mind, though, that it took awhile to gain the weight and it may take awhile to lose it also.